I picked this machine up from a member with no faults. It’s been 25 odd years since I played one of these machines. It’s a BFM/Noble Samba. There’s something amazingly ‘panicky’ about not knowing when the nudges are going to kick in. If you’re quick enough you get 6 every time, but it’s tough to think quick enough and be ready in time, so you usually only get 6 nudges. Massive thanks to Alan for letting me have a full tube of original 10p Tokens with it. Curiously, it pays 1x10p and 2x5p’s for the 20p wins, Tokens for the £1 Jackpot and 10p’s for all other wins. This machine is running how it should and is a lot more generous than I remember them which goes to show how much the ones back in the day were ‘doctored up’ to reduced the number or holds and nudges you got. It’s in good shape, just needs some locks and that’s about it. I suppose I could spray the metal bar on the front, but I’m not bothered about that. 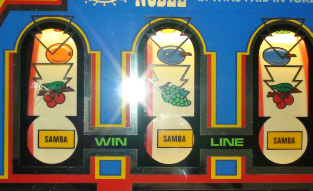 March 2012 - Samba won’t pay out!